Retro, funky and too cool for school the Mr Miller 60’s inspired vase will add creative charm to your home interiors. Mr Miller is a ceramic vase or storage pot featuring a colourful hair-do, marvellous moustache and suit and tie. His partner, Mrs Hoffman is his matching counterpart and is available to purchase from Rockett St George too. This quirky man vase measures 24cm in height x 17cm in width x 6cm in depth. 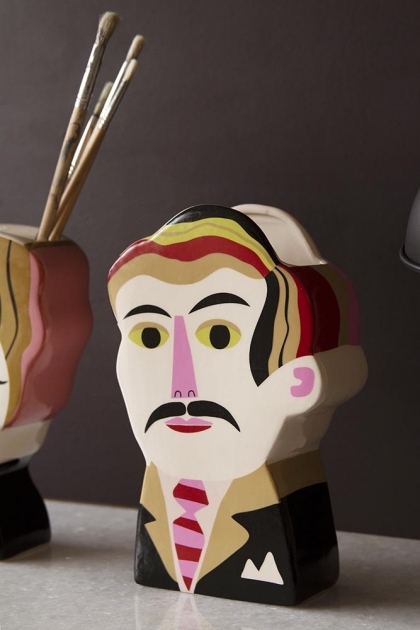 Anyone who loves kitsch, retro home accessories will love this moustache gentleman vase. Designed by Swedish based illustrator, Ingela P. Arrhenius, the artist has a distinctive knack for characterful 60’s style illustrations and the Mr Miller Vase is no exception! Perfect for those of you who want to inject colour and personality to your interiors, we think that you will love displaying your Mr Miller Vase on your shelves, side tables, coffee tables, windowsills and console tables. Guaranteed to catch your eye as soon as you walk into the room! A multi-functional decorative vase the Mr Miller 60s Inspired Vase is a uniquely versatile storage container that you can re-purpose around the home. Store pencils, pens, paintbrushes, make-up brushes or cosmetics in your 1960’s Style Vase. Or, alternatively, style long stem flows in this funky vase oozing with personality. What’s more, we also think that this retro display vase would make a wonderfully unique gift for friends and family members who love eclectic homeware.